James W. Monaghan began operating a confectionery at 1602 West Superior Street in 1908, in a little building in front of the New Clarendon Hotel. It operated as The Garfield News Stand and sold newspapers, magazines, candy, cigars, and cigarettes. Joseph B. Archambault took over in 1909, and four years later Bernard Pierce replaced him and stayed on until 1930 when Louis Szoztak took over the property. In 1938 Szoztak hired Abraham Holstead to design the yellow brick Art Deco Garfield News Building, which stands on the corner today. The new building also contained a small counter and stools and served breakfast and lunch. Its location at what was then the city’s busiest intersection made it a popular stop for those waiting for the bus to Superior (or entering Duluth from Superior) to stop and grab a cup of coffee, some cigarettes, or a newspaper. The Szostak women—Louis’s daughter Alyce and daughter-in-law Leona—ran the place until 1978 when Leona died. 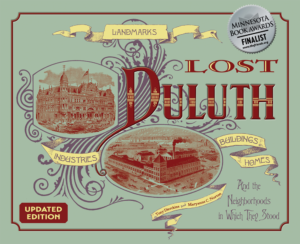 (Louis worked at Duluth’s Zenith Broom Co. for seventy years, since he was thirteen years old.) Louis’s son Ted, a postal carrier for thirty years, took over after that. He kept the Garfield open despite very limited stock until 1990, when he moved into an assisted care facility; he died in 1993. Despite an award-winning interior renovation by owner Alessandro Giulianni, the 1938 Garfield News Building currently stands unoccupied.